Manic Party Photo Booths for weddings and parties in Leeds, Harrogate, York, Bradford, Wakefield, Castleford, Pontefract, Dewsbury, Barnsley, Huddersfield, Halifax, Sheffield and surrounding areas. Julia & Liam hired the booth for their wedding reception at the Holiday Inn, Barnsley in March. Despite having two feet of snow outside the party proved to be really hot with the photo booth providing non stop pictures. At the Thorpe Park Welcome Back Party in Cleethorpes, the booth was in constant use. A great party with a Queen Tribute band, comedians, dancers and of course Star Photo Booths. Two Birthday parties at Bar 11 in Halifax saw the booth in the same venue on two concecutive weeks in February. As usual the booth was a great success. Recent parties during the festive period include Christmas office parties for a firm of solicitors in York, a road haulage company in Leeds and a manufacturing company in Sheffield as well as a number of smaller bookings. As usual the photobooth was in great demand at each event and a good time was had by all. Yorkshire couple Stacey & John from Leeds booked a photobooth for their wedding reception at Hollins Hall Hotel, Guiseley and had a marvellous time dressing up for the picture strips. Most of the guests left video messages and they all had a great time pulling faces and posing for fun photos. With over 100 guests this was a very busy wedding reception. The pictures will provide happy memories to look back on. Tom's 18th birthday party in Barnsley was a huge success for the booth. We had a constant stream of guests using the photobooth throughout the evening and provided some outragous pictures. Happy Birthday Tom. Angela's birthday party in Halifax provided a constant stream of activity in the booth. The photobooth was supplied as a surprise gift by a group of work colleges from the Yorkshire Building Society, who had raised a collection and wanted to get her something different. I am sure that her party pictures will be the talk of the office for many weeks to come. Thank you to Jill for booking us at Cedar Court Hotel for husband John's 50th birthday, a fantastic night that was only made better by coinciding with Fireworks weekend. A terrific time was had by everyone and we gained several enquiries for christmas parties in December. Recent weddings and parties in Leeds include Hunslet Boys Club, Woodkirk Valley Country Club, Holiday Inn Tong and Hilton Hotel Leeds. Shammies 21st Birthday at the Hilton Hotel, Leeds was a hit with the booth. Everyone loved the fact they got to keep the pictures and that you could visit the booth as many times as you wanted. 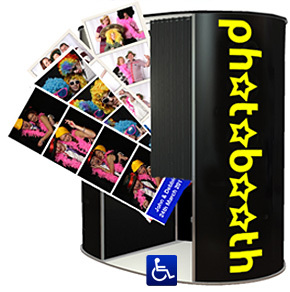 A photo booth is a great way to entertain your guests and get some great photographic memories of the event. Recent weddings in Harrogate include the Swan Hotel and the White hart Hotel. Harrogate is a fantastic place for a party and as usual these two events were great. Everyone loved the moustaches and big glasses and the booth was busy until the end. We are looking forward to more booth parties in Harrogate. At Jackie and Simon's wedding at Park Inn, York our green screen technology proved to be a hit. As well as proving movie star themed fancy dress and props we were also able to provide a range of similarly themed backdrops to make the picture strips stand out. This went down well with the couple as they had arranged for a movie star themed reception with all of the tables named after great movies and a movie themed quiz during the speeches. All of the guests proved to be stars in our fun photo booth. At a recent black tie dinner party for a local company our photo booth proved to be a great ice breaker getting everyone into the swing of the party. Our booth was customised to their company colours and logo and their logo was on the backgroud of all ofthe pictures. Both employees and associates all went home with a lasting momento of this event in the form of a photo strip of great pictures. A great way to build lasting business relationships. Many of the guests really let their hair down (or rather our afro wigs) in the booth creating some great memories and a party that will not be forgotten.